To make great signs that last as many years as our signs do, you start with excellent materials. 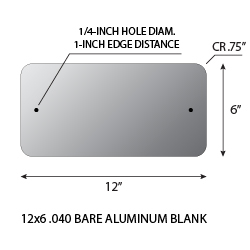 We use 5052-H38 sheet aluminum in ..050, 063 or .080 gauges pre-treated in accordance to ASTM Designation: B 449. Surface of the sheet aluminum is cleaned, deoxidized, and coated with a light and tightly adherent chromate conversion coating free of powdery residue.